Die-cut up to 1,000 sheets at once with the Arrow DBF die-cutter. Utilizing special cutting software and dual blades, the DBF allows you to create cut files with ease. Using two sensor marks allows for precise cuts on substrates up to 300gsm. 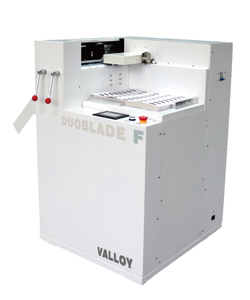 The dual cutting heads double your cutting speed for a fast-finishing option for sheets. The DB-F utilizes an advanced top suction feed system and high capacity feed tray, capable of holding 1000 sheets, minimizing downtime and maximizing efficiency. Dual automatic heads adjust to your art file for a fast and seamless experience. Precision tolerances hold registration with pinpoint accuracy.